Fly Mobile has unveiled its new Dual GSM mobile phone dubbed as Booom (MC105) with advanced multimedia features and first of its kind big 30 x 40 mm speaker and an in-built amplifier for really loud sound blast that builds up to a musical crescendo for a truly entertaining experience. 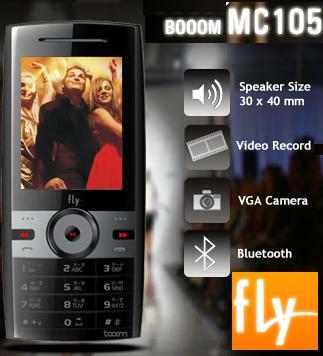 The FLY Booom (MC105) mobile phone has a 3.5 mm universal audio jack, FM radio with schedule recording, 5 different FM alarms, dedicated volume control keys and comes with an audio player that displays album cover, background and lyrics. Up to 15 FM channels can be saved on it with their specified channel effect and one touch access to different features through navigation keys. The Boom MC105 an elegant phone at just Rs.3649 is drawing everyone with its features like Mobile Tracker, password protection, call black listing, SMS filter etc., and it can also send a pre-specified SMS as and when you reject a call. In case if you forget to wish your near and dear ones on their birthdays and anniversaries, you can pre-set an SMS message for a particular date, time, mobile number or contact in the phonebook on to your Fly Booom (MC105) and your wish gets automatically sent at the appointed day and time. The handset has USB-chargeable 1200 mAH battery for significant music time or 8 hours of talk time, a 2 GB memory card that comes pre-loaded with entertaining Bollywood content, 4 GB expandable memory and Bluetooth capability. What’s more, the modem within the phone can be connected to a PC that’s Bluetooth-enabled for dialing up and surfing the Internet. Some other features that make Fly Booom a hot pick off the shelves include dual SIM (GSM+GSM), one touch access to different features through navigation keys, 1000 contact phonebook, LED torch and GPRS. When it comes to camera capabilities, Fly Booom has a VGA camera , image viewer and different photo effects. It also has a 3GP/AVI video player and can record video in AVI format. The Indian calendar helps you plan your holidays besides tracking festivals and auspicious days. rate shouldn’t b more than 2500 best buy for all consumers.